Here I am sitting on deck, on the wood padded by my life preserver, listening to the usual daily band concert. Lois is beside me and I notice she is also writing to you, so you may get some repetition. But since you haven’t had any mail from this quarter for some time, 2 letters, even though they say the same thing will no doubt be welcome. Our trip to date has been O.K. though I must admit that my actions on the Leviathan 19 years ago were far more commendable than were my actions the first two days out this time. Yes, the first afternoon of motion kind of got me a bit unsteady and then waiting in line for dinner and crowded stairs where it was hot and stuffy put the finishing touches on everything, so I rapidly declined dinner and made for the rail. I wasn’t much better off outdoors, so, though our rooms were pretty stuffy I felt much better flat on my bunk and consequently spent most of the next day in that position. That second day of motion I managed to eat and keep breakfast, but couldn’t stay more than a few minutes for dinner. Though, on my bunk, I later enjoyed a couple of turkey sandwiches Lois brought me. Since that day, however, I’ve felt fine and have long since made up for the missed meals. Lois has been a regular sailoress and though she was bad for a couple of days, having a bum cold (which many have had), she has more than done justice to the ship’s cook. 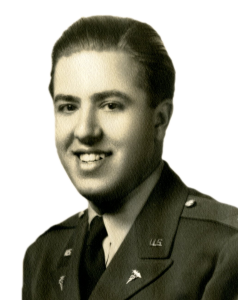 We are served only two meals per day – our bunch gets in at the second sitting and the new head nurse and Marv Kahn got together and did some fineegling so that Lois and I are not only at the same table but are next to each other. We sit at a long table opposite Carroll Russell and Bret Smart – the latter two continually heckle Lois about her appetite. They kid her about getting fat and how she’d get stuck in a port hole if she tried to get out of the ship that way; how she’d better watch out or I won’t marry her if she’s fat, etc. It’s really a kick and Lois is in hysterics through all the meals. At the other side of Lois are Fran, Gert and Bam and opposite them are Armanini, Halter, Drew and Bryner. Poor Halter has also taken somewhat of a ribbing about his lack of appetite and his peculiar taste. He eats all the queer things that appear on the menu daily, such as salted herring, tripe, codfish with pork scraps, etc. And not only for breakfast, but for dinner, too!! Of course, besides these things he never can make up his mind which of the entrees he wants, so he just naturally has to have both. Why, even Lois doesn’t keep up with Halter! We have really had excellent meals all along: rare roast beef, turkey, veal, and even duck. We’ve also had ice-cream for dinner a couple of times, though jello has been the dessert a good part of the time. Dinner for us comes at 6:00PM and breakfast at 8:30AM, so we generally make a sandwich at breakfast for our luncheon, and with an apple or orange to add to that we manage to survive between meals. I’m in a cabin with Drew, Carlson, Bryner, Hamilton, George Davis, Cy Johnson an engineer (Geissler) and one other fellow. The bunks aren’t bad at all, though at night it gets sorta stuffy. Fresh water is scarce and only used for drinking purposes, and occasionally for a little shaving or sponging. Taking a shower in cold salt water certainly leaves one nice and sticky and not feeling any cleaner, so we’ve all sort of had our nasal mucosa become less and less sensitive to such odors. And as we sit on the floor of the deck frequently (their being no chairs, of course) our clothes are beginning to stand up in the corner by themselves at night. We are able to be together for about 15 hours of the day and have spent almost all but our meal hours on deck. During the day we have played quite a bit of bridge, but every so often it gets a bit too windy and though so far we haven’t lost any cards over the side, we have been forced to quit frequently when the ship changes its course and leaves our previously protected corner exposed to the elements. We also have played some chess and occasionally do some reading. We found a copy of Cyrano on the boat, and we’ve read some to each other, but it is a bum translation so not as enjoyable as it might be. The ship has a broadcasting set-up so that there is music from recordings heard most of the day. In the afternoon there is a band concert on deck and it is usually pretty good. In the evening there is always a program being broadcast over the boat (inside) – local talent performing, but I haven’t heard much of this as it‘s been much too nice on deck to miss the fresh air available there. Several of the gals have been sick – some of them even spent a good part of the trip in the hospital. Ag Alkiere and Miss. Bell were the sickest and Chris Colletti likewise was pretty bum for a few days. All are now O.K. however. I imagine that by the time you get this, it will be well into the New Year. I hope all had a good Xmas and brought the new year in right. We will be thinking of you even more on these days. Well ‘tis all for now. 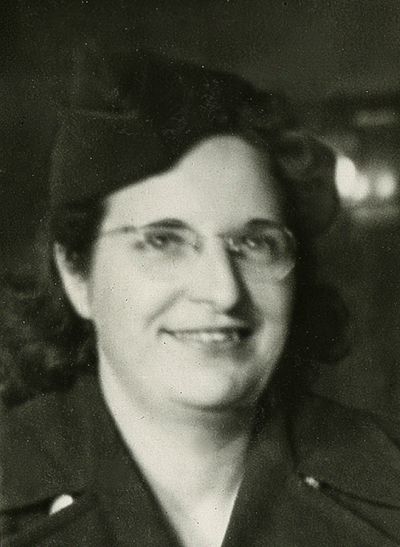 Click here to read Lois’ letter to Rene´s family. René, Lois and the rest of the 59th Evac. Unit departed from New York on December 12, 1942 on the Uruguay, heading for Casablanca, Morocco. When launched in 1927, the ship, originally dubbed SS California, was the world’s first major ocean liner built with turbo-electric transmission and the largest merchant ship yet built in the United States. 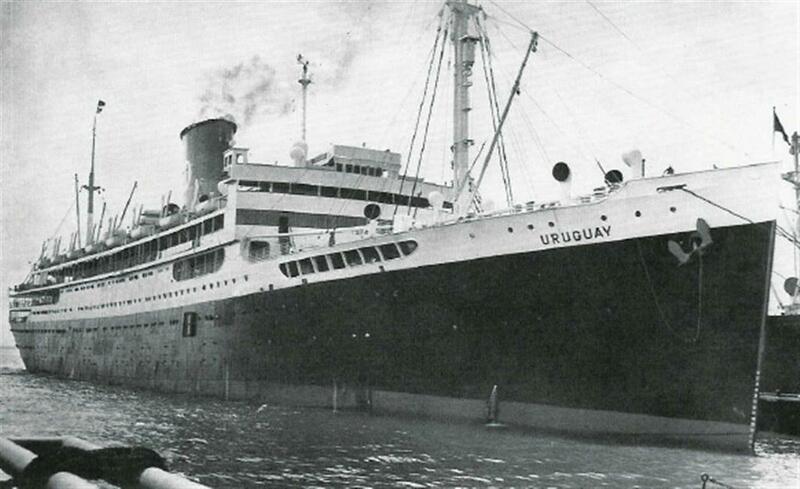 In 1938 the California was renamed Uruguay and from 1942 to 1946 she was operated as a United States Army Transport ship (USAT). She was returned to civilian service as SS Uruguay in 1948, laid up in 1954 and scrapped in 1964.